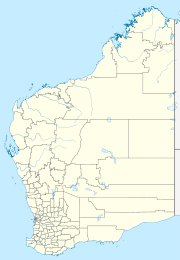 Wingellina or Irrunytju Community is a small Indigenous Australian community in Western Australia located about 1,700 kilometres (1,056 mi) north east of Perth near the Western Australian-South Australian border in the Goldfields-Esperance region of Western Australia. Surrounded by large granite hills with mulga and mallee country, the community maintains many traditional activities such as hunting and gathering bush tucker as well as making many carved wooden artefacts. The community is situated 12 km South West of the Surveyor Generals Corner near the NT-SA-WA border in the Gibson and Great Victoria deserts. Wingellina Layout Plan No.1 has been prepared in accordance with State Planning Policy 3.2 Aboriginal Settlements. It currently exists in draft format only, having not been endorsed by the community. The map set is viewable at Planning Western Australia official site. The community is located within the Determined Ngaanyatjarra Lands (Part A) Native Title claim (WC04/3). ^ "The Ngaanyatjarra People". 2009. Retrieved 27 January 2011. ^ "Wingellina Community details". 2009. Retrieved 27 January 2011. This page was last edited on 10 February 2019, at 13:15 (UTC).